Over the 12 month period from October 2016 to September 2017, I rode 4587 miles. Since October 1st for this year, I have ridden 890 miles toward a goal for 12 months of 4800 miles. 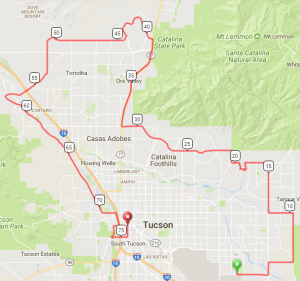 On Saturday, November 18, I rode the 76 mile route of the El Tour de Tucson. The map shows the route.